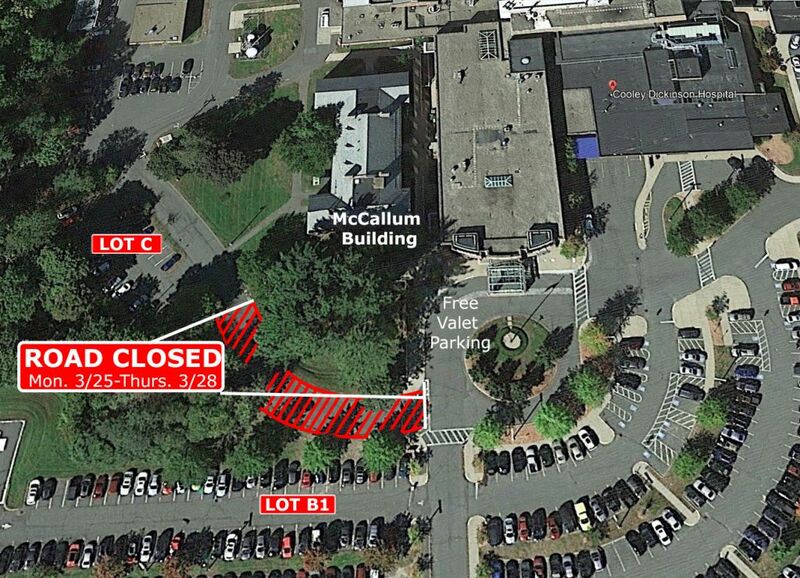 Beginning on Monday, March 25 and continuing through Thursday, March 28, a tree removal project will begin near Cooley Dickinson Hospital’s main entrance, adjacent to the McCallum building. Access to the roadway connecting the front and rear parking areas at Cooley Dickinson will be limited during the week of March 25-29. As a portion of the road – see diagram at right – will be blocked off to facilitate tree removal, the Facilities team strongly recommends that all employees, patients, visitors, volunteers and others avoid the area while the work is in progress. Tree crews will work daily from approximately 7:30 am until 3:30 pm. In order to remove the trees, the portion of Hospital Road that connects the front and back parking lots will be closed through Thursday afternoon. Why Are the Trees Coming Down? A strong windstorm in late February caused one of five trees in a cluster of pine trees to snap in half, causing damage to nearby automobiles and blocking the roadway. Fortunately, no one was injured, but to avoid the possibility of future injury and/or further damage to property (including hospital buildings), the remaining pine trees will be taken down. During the tree removal project, the noise will exceed typical levels due to the running of necessary equipment. The Facilities team apologizes in advance for any inconvenience this may cause to nearby offices and patient areas.